Before you read this, read quickly this to have an overview of how the three main currencies on which Steemit is built upon work. As you will notice, SBD currency works as a sort of short-term debt. In fact, in the startup world, short-term resources are needed to make sure to sustain the operations and grow over time. Startups use convertible notes to achieve that. This is a sort of short-term debt that gets converted into equity at successive rounds of funding of a startup. Steemit uses a similar form of short-term debt: the Steem Dollars. In fact, this works exactly like a convertible note. There is only one issue with these kinds of financial tools. You want to make sure you cap them to avoid the risk of getting into bankruptcy for a shortage of liquidity. If the debt level were to exceed 10%. If the amount of SBD debt ever exceeds 10% of the total STEEM market cap, the blockchain will automatically reduce the amount of STEEM generated through conversions to a maximum of 10% of the market cap. This ensures that the blockchain will never have higher than a 10% debt-to-ownership ratio. Thus, to have a rough estimate of the financial health of Steemit, you might also want to look at whether the debt-to-ownership ratio is lower than 10%. The more it touches that threshold, the more the blockchain will intervene to limit the conversion of STEEM from the platform. This would also limit the ability of Steemit members to exchange their SBD and SP in STEEM, which over time erodes the trust of the community. The ratio is 4.9% given by $38,435,033 / $773,754,507. 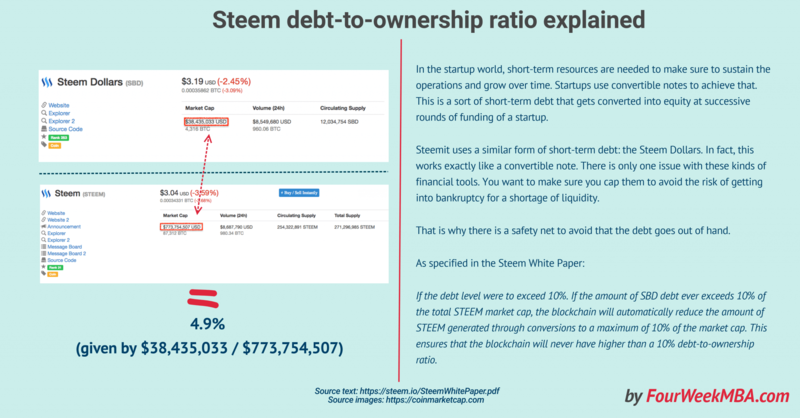 The more this ratio gets close to 10% the more the blockchain will have to intervene to rebalance the debt-to-ownership rate by limiting the availability of STEEM for the Steemit community. This as already remarked might erode the trust of the community while also making it less attractive from a financial standpoint. The Steem Dollars (SBD) is one of the three currencies on which Steemit is built upon. The SBD also has a critical role. In fact, this works as a sort of convertible note that allows Steemit to finance its short-term operations by borrowing “sweat equity” from its community members to sustain its growth. Thus, having the ability to emit SBD is critical for Steemit to survive. However, it is also crucial to balance the SBD with the STEEM available on the market. In fact, like any other startup, Steemit needs short-term debt, but it needs to adjust it with the equity available on the market. That is why the Steem Blockchain has a mechanism that allows limiting the emissions of STEEM available through conversions. If this mechanism is critical as it works as a safety net that allows the short-term survival of the community. If the 10% threshold is reached too many times, this might erode the trust of the community over time as the rewards will become less and less convertible on actual currency. This would also make the Steemit less interesting from the financial incentives standpoint. Thus, you might want to keep an eye on this metric.